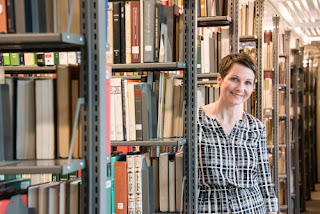 __Chicks Dig Poetry__: Talking About "Good Bones"
As any poet who has experience this will tell you, having a poem catch on--to go viral, to be replicated and shared even among those who don't usually consider themselves to be readers of poetry--is a strange feeling. For Maggie Smith, it's fair to say that the effect has been tectonic in scale. 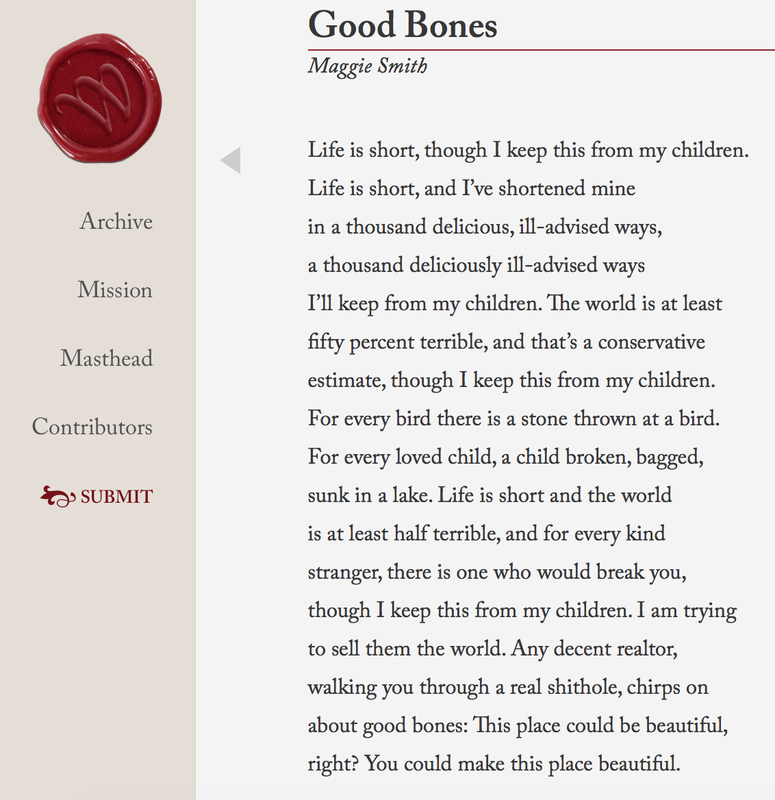 Her poem, "Good Bones" (originally published in the journal Waxwing), has been shared on Twitter by numerous celebrities; translated into multiple languages; interpreted in music and dance; used as a plot device on the television show Madam Secretary; and recited by Meryl Streep in front of a crowd at New York's Lincoln Center. Public Radio International named it "the official poem of 2016," estimating it to have been read by a million people. Her poem was made into a limited edition broadside (seen left; you can purchase it here). 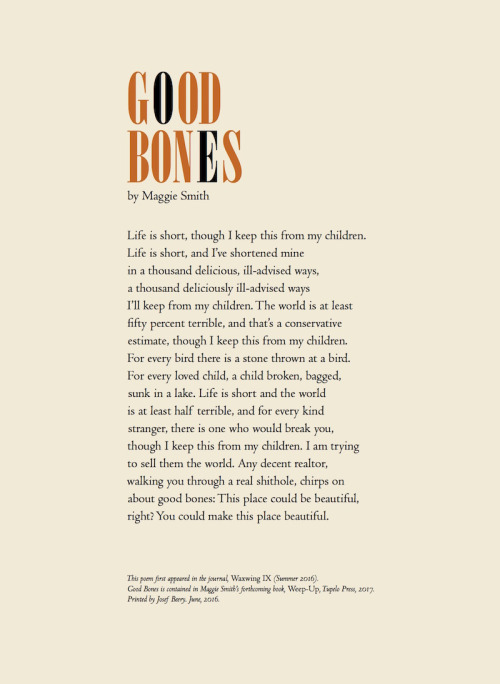 Her forthcoming book, previously titled Weep Up, has been retitled Good Bones (cover art below; you'll be able to purchase it from Tupelo Press this September). I read the poem the day it was published, via an editor's Facebook link. Poets shared it, as poets do. But within the day, all kinds of people were sharing, tagged with comments mourning the attack on the Pulse nightclub in Orlando. (Another poem that resonated was "At Pegasus," by Terrance Hayes.) Sharing surged after British politician Jo Cox was killed, and again after America's presidential elections. Last night, as news spread about the bombing at pop star's concert in Manchester, "Good Bones" began making the rounds. The bittersweet side of this poem's success is that it's not a harbinger of happy times. Smith's words are embraced by those looking for comfort in the wake of disorder or outright tragedy. This is the kind of poem you spontaneously bring in to share with students on a numb and gloomy day. Or perhaps this is the kind of poem a student brings in and says, "I want to write about this." In the classroom, there will be a real temptation for any discussion of "Good Bones" be entirely thematic in focus. This is a poem about salvage, someone might say. This is a poem about hope. 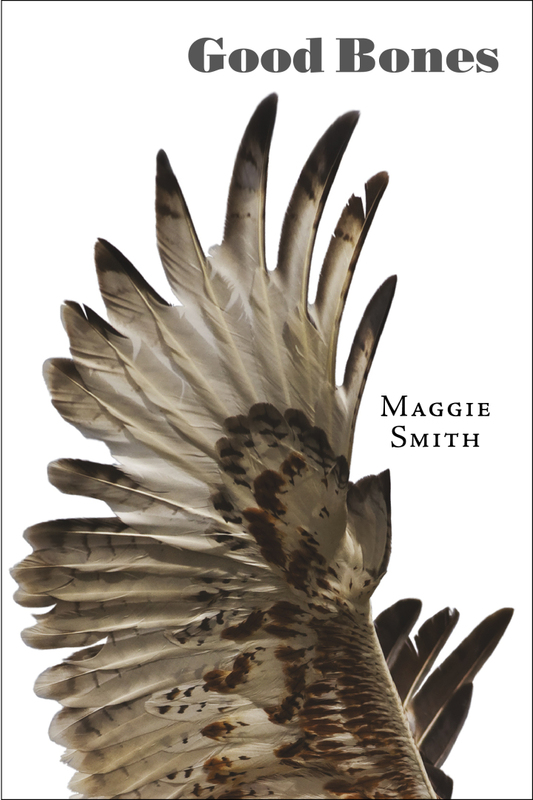 But to praise a poem on entirely topical terms is to miss out on Smith's precise craft. Life is short, though I keep this from my children. The first line--neatly endstopped--establishes a first-person speaker, identifies the speaker as a parent, and adds urgency by conveying its information in present tense. The poem presents a familiar truism ("Life is short"), but then personalizes the banality by framing it as a secret to be kept. The reader becomes complicit in the ruse. I’ll keep from my children. If you pair the first clause (in line 2) and the final one (all of line 5), this sentence mirrors the opener--with the subtle shift into future tense, creating a pledge on top of line 1's claim. What interests me is how the speaker's character is developed substantially in the middle clauses, identifying with an impulse toward pleasure. At first, the comma proposes that "delicious" and "ill-advised" are in contrast to one another; in the refrain, the voice admits that the ways are delicious precisely because they are ill-advised. The speaker's choices made outside of being a parent is yet another secret to be kept from the kids. estimate, though I keep this from my children. Secret #3, kiddos: life is short, yes; we're not in the best of all possible worlds, either. The first enjambment teases us by briefly teetering toward optimism (the "at least" in "The world is at least...") before a reality of pessimism sets in (the completing "...fifty percent terrible"). 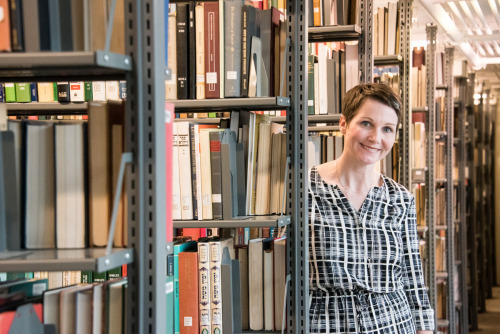 The usage of a numerical figure moves us to thinking about studies, statistics, and the march of infographics signature to contemporary reporting. The second enjambment splits "estimate" from its modifier of "conservative," leaving that word dangling in the eye of the reader. One's mind might go to the modern dichotomy of American politics (liberal vs. conservative), though the motive could simply be conserving the median length of line. For every bird there is a stone thrown at a bird. If you're going to assert a "terrible" state, you have to provide evidence, harnessed here through anaphora. The image of line 8 is straightforward: for every bird, symbolic of nature, man makes a gesture attacking nature. This is the ecological balance of of today's world. Note that this line is also endstopped, free of commas or other intermediate grammars, which anchors the poem's syntactic momentum. Lines 9-10 raise the stakes to human life. The previous sentence is the first to omit mention of the speaker's children. 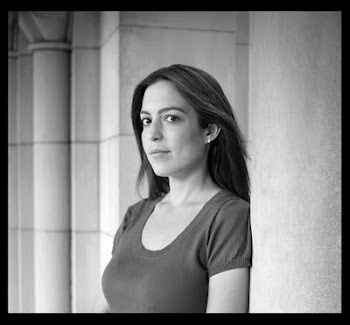 In this sentence, that awareness returns in the distillation of a "loved child" and, in symmetry, one subjected to violence--violence driven home by the hard consonance of "broken," "sunk," and "lake." In another poet's hands, this equation-making could become expository and prosaic; Smith smartly relies on the comma after "For every loved child," creating a midline caesura that fills with dread for the reader. though I keep this from my children. The diction relaxes a bit here ("half" instead of "fifty percent"), as the speaker reflects on the accumulated realizations of the first ten lines. We return to the refrain of "though I keep this from my children," but the power and authority located in the decision has been diluted. This is also the first occurrence of "you," though we don't pay too much attention to the word choice because of its colloquial stance. to sell them the world. Ignorance is not enough to protect them. Isolation is impossible. So what the speaker must do, instead, is attempt to promote engagement. The metaphor of "sell" takes the risk of moving us to the realm of commerce (raising questions of sincerity). Rather than dodging these connotations, Smith doubles down on the conceit of real estate. How strange and wonderful, in a fraught landscape, to encounter the humor of these lines. "Decent" is the perfect choice, implying good but also good-at-one's-job, which in this case is the task of closing the deal. There is a perverse, lively internal music between "realtor" and "real shithole," and the crassness of the latter term cuts through potential sentimentality. "Good bones" is an appealingly familiar term of real estate (there is an HGTV show called Good Bones) that summons thoughts of the body. Note that there are two deft conflations executed in this sentence. The first conflation--activated by the verb choice of "chirps"--is between the realtor and the bird of line 8. The impact of this is that we're encouraged to favor this character, regarding the realtor as ally rather than predator. The second conflation is between the "them" (the children of the previous sentence) and the "you" who is now taking the tour. This second conflation is significant because in these final lines, a facade drops. Though this is positioned as dialogue in-scene, these sentences break the fourth wall of the poem. We may argue that we're trying to sell the world to our children--that may be a useful external priority--but the truth is that we're trying to sell it to ourselves as well. The "you" becomes invitational and encompassing of the reader. Note, too, how the seemingly declarative repetition of "beautiful" is undercut by the modal verb choices. This is about what "could be," not what is. The penultimate line's enjambment leads into the affirmation-seeking "...right?" 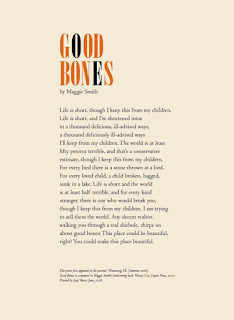 The irony of framing this as a text of comfort is that what appeals about "Good Bones" is its indeterminacy, the liminal space it occupies between hope and despair. That's what rewards multiple re-readings. That's what makes us trust the poem. Why am I sharing a text that you've probably read in at least a dozen other places? Because I'd like for you to see it with fresh eyes. Because I want Smith to be credited with more than "Right place, right time, right emotion." I'd like for you to see what I see--phrasing that sticks to your ribs not just because of its politics, but because of its construction. Form enacts content, I say to my students. This poem can be used to explore how to take on a big idea and ground it in bright, specific language and technical decisions on the page. Hi. I'm writing for a few reasons. One is that today is a hard day for chicks full stop, and I feel like there could be a little solidarity shared at such a difficult time. Another reason is that my babysitter showed me this poem and I was overwhelmed with its impact (like all good poetry) so I went searching around to read it a few times over, leading me here. My third reason, and most important, is because I'm shocked no one has commented on this blog post yet: You truly enhanced my interpretation of this poem from start to finish. Your essay is exquisite, and I love it. Thank you for writing with such care and description. I hope my comment might make you feel a little bit like answering the poem's final question in the affirmative, especially at this difficult time.